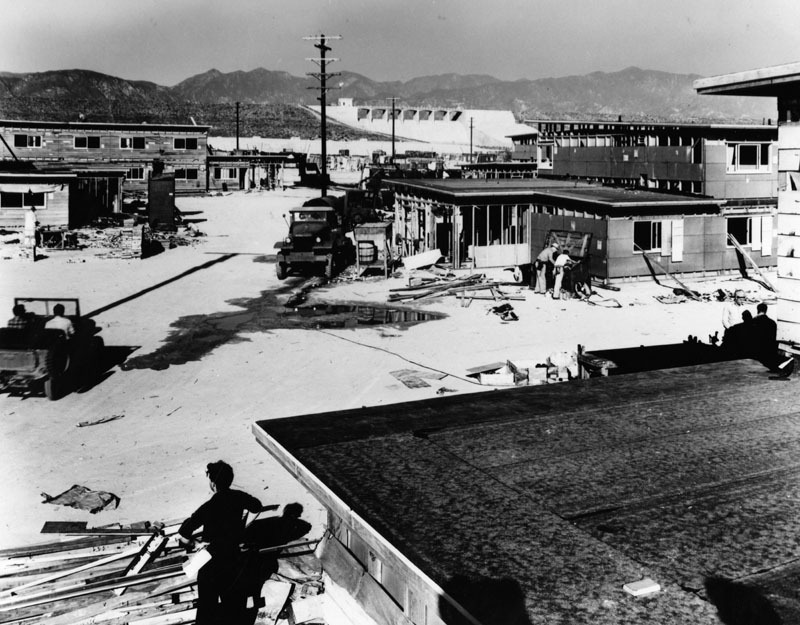 In June 1946, two months after Rodger Young Village opened near Griffith Park, the Los Angeles City Housing Commission announced the start of another large federal, state and locally-funded veterans’ emergency housing project, Basilone Homes. Like Rodger Young Village, it was to be named for a war Hero, in this case John Basilone, the Marine Gunnery Sergeant who received the Congressional Medal Honor for heroism above and beyond the call of duty in the Battle of Guadalcanal in 1942 and the Navy Cross, posthumously, for extraordinary heroism during the Battle of Iwo Jima in 1945. The 112-acre site was located at 10160 Glenoaks Boulevard, then a rather remote site near Hanson Dam in San Fernando Valley. 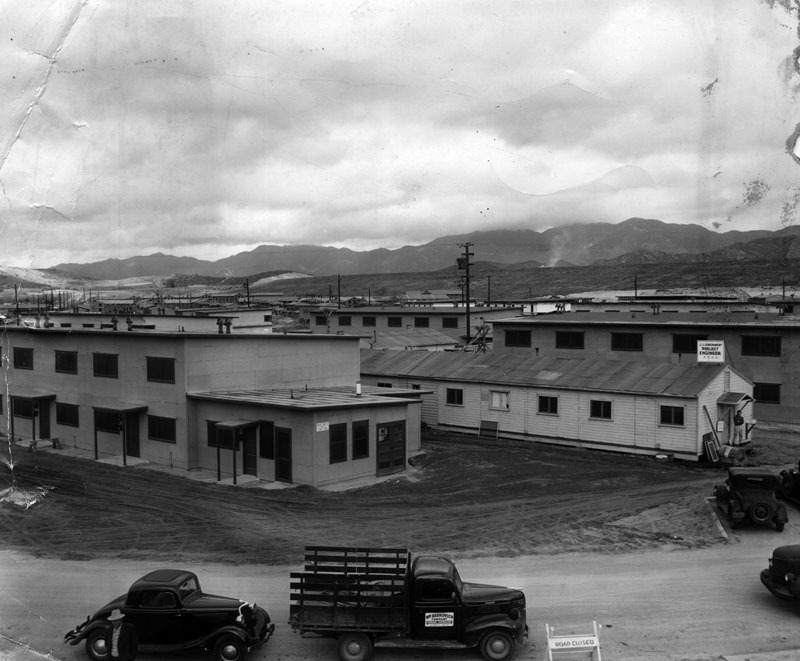 Housing would consist of surplus war housing and barracks relocated from Port Orchard, Washington. 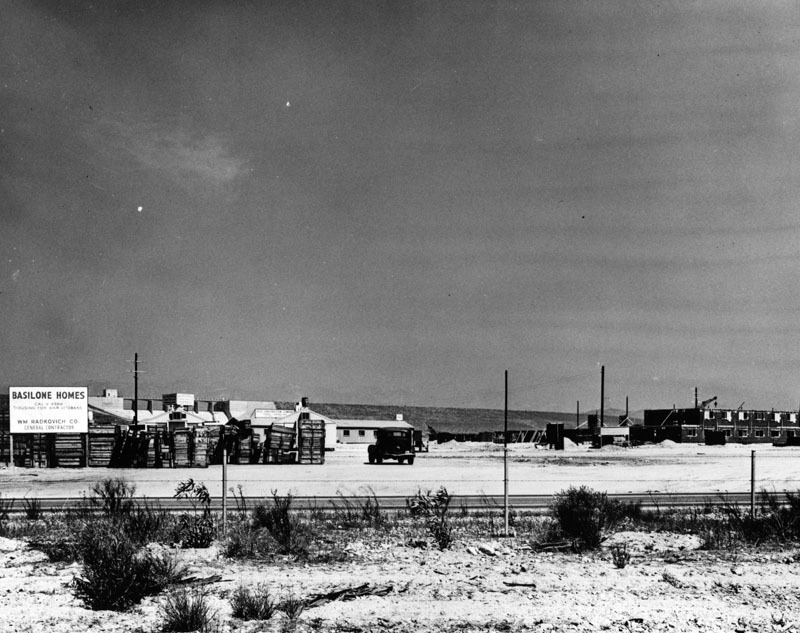 Basilone Homes, c. 1946-1947. 10160 Glenoaks Boulevard. LAPL. But work preparing the site stalled almost as soon as it began. In late December, the Federal Housing Authority announced that it didn’t have the funding for the project and that work must halt. Construction on Basilone Homes languished into the new year. Mayor Bowron made a visit to Washington D.C. and on January 18, it was announced that funds had been secured. The project was given the green light to proceed, though reduced in scope from 1500 units to 1498, then by another 540 units. 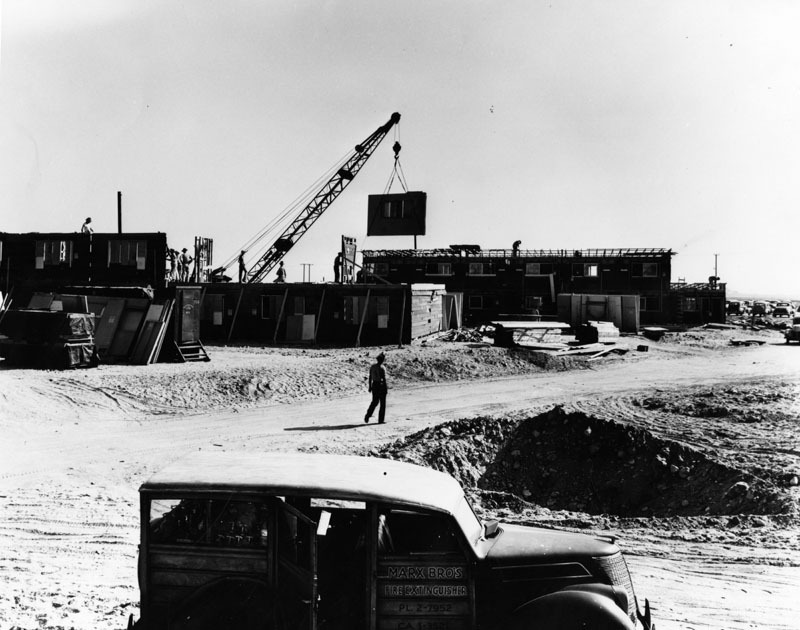 Construction underway again at Basilone Homes, 1947. LAPL. Reconstructing surplus war housing at Basilone Homes, 1947. LAPL. A month later, February 17, 1947, without the fanfare that marked the opening of Rodger Young Village, veteran families began moving into their new residences at Basilone Homes. 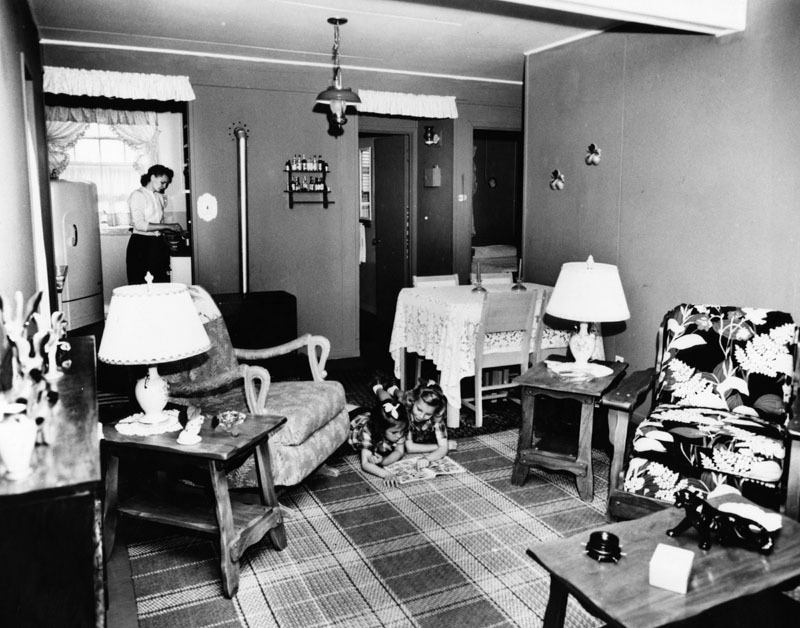 A typical unit consisted of a combination living room-dining room, fully-equipped kitchen, a bedroom and a bath and rented for $27 unfurnished and $31 furnished, including utilities. The tract included a grocery store and other shops (some veteran-run), a school, playground and other facilities. Basilone Homes ready for occupancy, February 17, 1947. LAPL. In late July, 1953, the some 4000 residents of Basilone Homes were notified that they might be receiving eviction notices, per Federal Housing Authority orders to close veteran’s housing projects. Rodger Young Village residents had already received their notices to vacate by October 1. 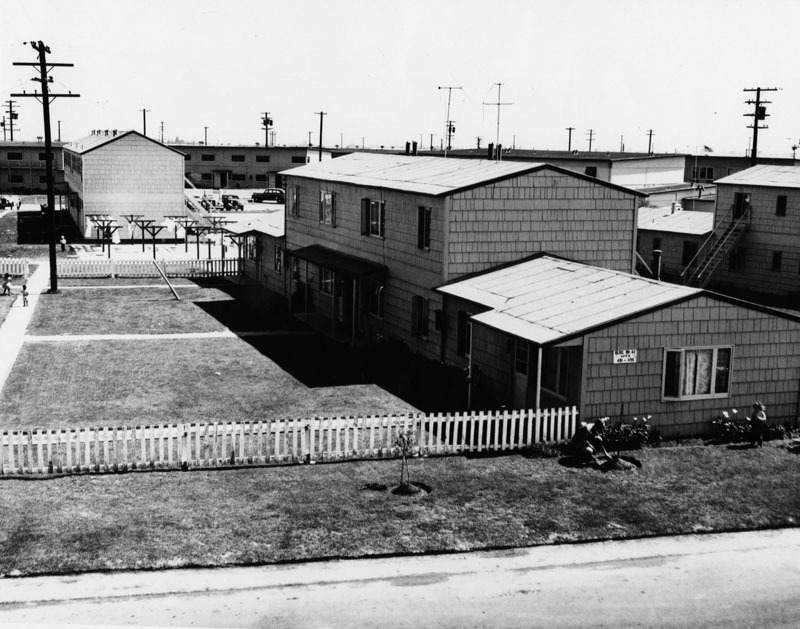 The Veterans Affairs and Public Housing Committee of the City Council intervened, and successfully pushed the eviction date for the two properties back to July 1, 1954. In September, however, the Federal Housing Agency ordered that both Rodger Young Village and Basilone Homes be closed by the end of February. Mayor Paulson, who succeeded Mayor Bowron, established a “Relocation Co-Ordination Committee” to assist residents in finding new homes, as affordable housing remained in short supply, particularly for families with children. 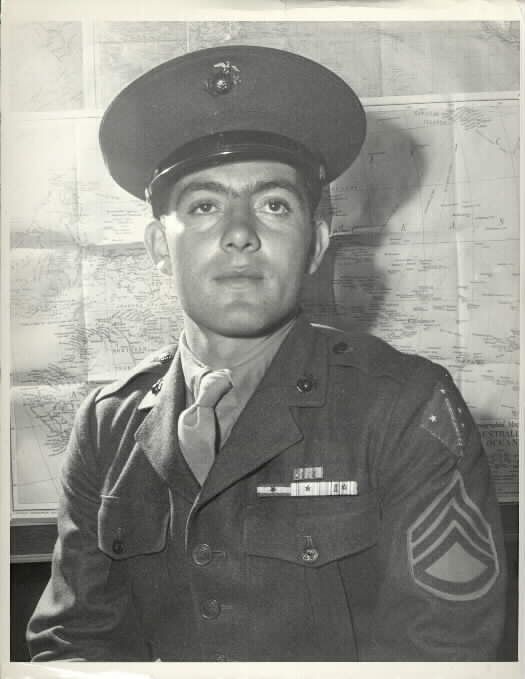 Basilone Homes, like Rodger Young Village, was declared officially closed on March 15, 1954. In June, the Board of Education approved closure of the Basilone Homes School, since the community it served had served was gone. In June 1955 the site of Basilone Homes at Hansen Dam served as a temporary race track for sports car races. A golf course was later developed here. Photos from Los Angeles Public Library, City Housing Authority Collection except where noted. Thanks for the research. When I was a baby, this was the first place my family lived in that I remember. We were on the second floor and I was so small that mom taught me to go down the stairs backwards so I wouldn’t fall. I still remember the long dark hallway to get upstairs.